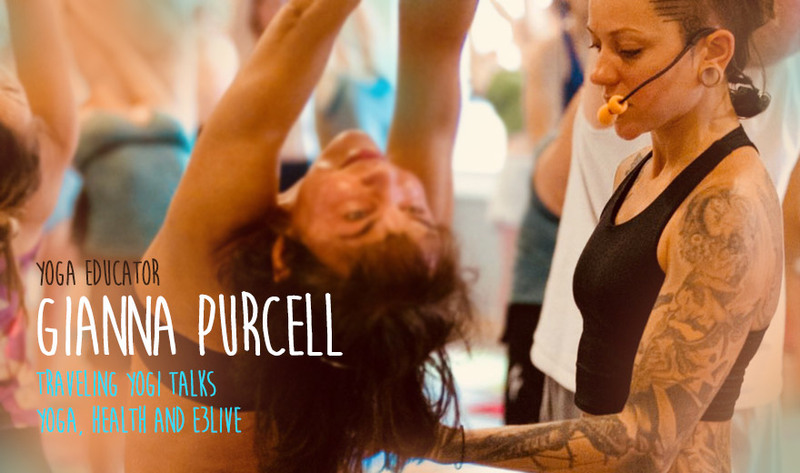 Gianna Purcell is a traveling yoga educator and practitioner of healthy living. Aching with back and joint pain, Gianna took her first yoga class and after just a few weeks of practice, her pain dropped; within a year, she was off all medications (ADHD meds, antidepressants and sleeping pills). 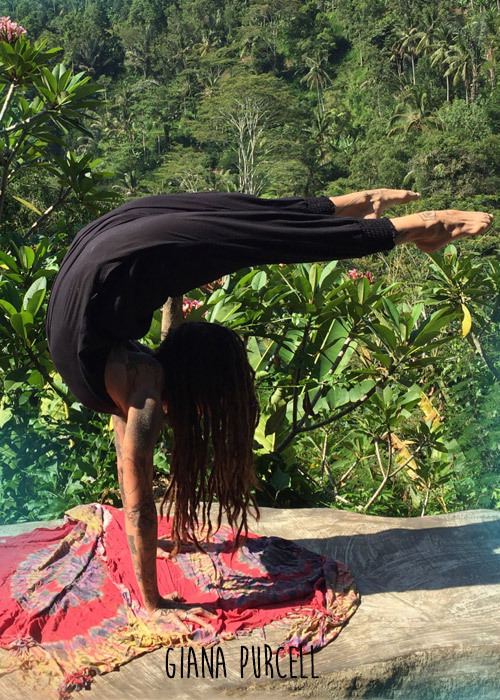 She completed advanced yoga trainings, competed in asana competitions, and continued to evolve her health and wellness regimens. Along with her yoga journey, Gianna started on a healthy path - eating nutrient dense plant food, including E3Live superfoods. We check in with Gianna while she's abroad in Australia about yoga, health and E3Live. I am a yogini through and through. My life is infused with and fueled by the principles of yoga. I grew up an angry second child of four in Chicago. Played music and did hair for a living until yoga started challenging my dependency on monetary stability and reflected to me the impact of living that life. Growing up filled with anger and rage, navigating through my own bodily challenges, learning to deal with and accept the passing of and illnesses of my parents, and beginning to look into my own demise with an open heart have all been lessons welcomed openly because of my studies. Thirteen years ago I decided to actually listen to myself and my responses to the outside world, stimulants, foods, drugs, and people. I developed a system of disciplines to alleviate these bondages and promote all things clean and healthy. When I was 13 my mother was diagnosed with Huntingtons. Her father passed from it and as life continued I watched it slowly steal her and all of her siblings. Watching someone die slowly throughout the formative years of your life can create a hardening as well as growth in many ways. After deciding to not be angry and realizing this could be my future, I started looking at what preventative medicine in my own life could be. I went vegan at 16, practiced raw food, Ayurvedic eating principles, did elimination diets, juice fasts, cleanses--just tried it all. All of this helped me realize my fear of death and my desire to control. So, I transitioned to intuitive eating, Tibetan Buddhist meditation practice, tantra yoga studies, and simply enjoying the pleasures and beauties of life free from expectation and attachment. I have never felt better! You're a traveling yoga educator - how do you maintain health and fitness on the road? I do lots of fasting while in the middle of travel and always come prepared with a few main crutches. 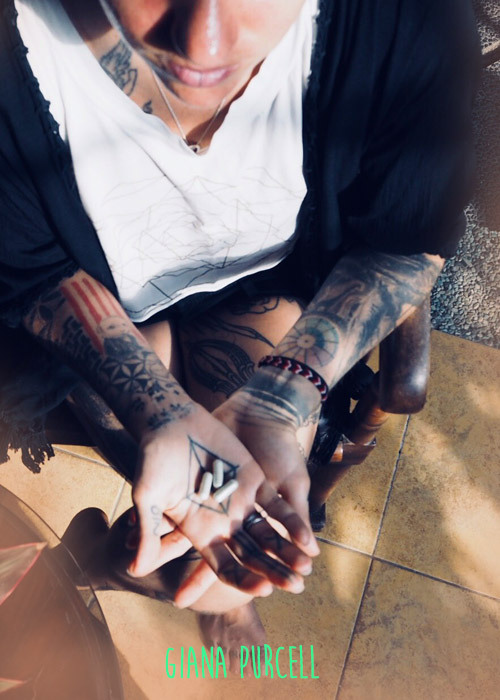 I always have chlorella tablets, magnesium, E3Live Blue Majik travel singles get dumped right in my mouth under my tongue and the E3 Enzymes Supreme I take daily throughout international travel. I always bring chia seeds, vegan milk powder, and a blender ball container for quick meals. Food is the number one savior while on the road. If I can leave room in my suitcase for the food that I know keeps me healthy and feeling good, then I don’t desire the pretend foods they pass around on the plane. 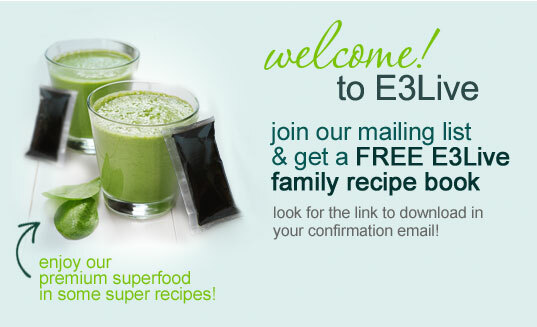 What are your favorite E3Live superfoods? I use three main E3Live products but love to try everything! E3live original fresh frozen is a staple for me while home, or the individual singles of BrainON for domestic travel. With tons of travel the Blue Majik singles are perfect for quick shots on the plane and in my chia pudding. And as morning and evening supplements I use the E3 Enzymes Supreme for digestive ease. How do E3Live superfoods affect your athletic and mental performance? Using E3Live has allowed me to keep things simple while trying to stay fueled. In deep practice or in the middle of leading trainings and intensives, there isn’t often time to think much about what to eat to still feel light but energized. E3Live takes care of all that. I feel instantly fueled and supported and don’t have to search for energy and healthy fuel. What is your go-to healthy meal? I literally eat and make the same things everyday. Chia pudding for breakfast, green juice for lunch, raw snack or treats, salad for dinner. Share some health and fitness tips. Your intuition is strong and knows more than we give it credit for. Trying to fit yourself into a diet box with fads and crazes only works for so long. Until you begin to stop and listen to bodily desires and needs, we allow for a slight disconnect between our inner knowing and our outside world. Before taking the next bite, actually sit with the smells, textures, and sensations experienced from the food or drink and proceed with that knowledge. Slowing down enough to notice our experiences in eating and in our fitness practices helps us decipher the information we are being given and continue on a path of that is unique to us. What's your favorite yoga pose? Which yoga pose do you think is the most beneficial? My favorite yoga pose right now, honestly is savasana. I am actually embracing rest which I have not easily done in the past. I think the most necessary yoga postures for the western body are backbending postures in any respect. Poses that move you up and over backwards reset our body’s nervous system, alleviate pain and stress in the spine, and elongates our often forward bent front body. Hopefully 2020 will bring a public space, family time, and many different platforms for me to share and for us to commune. "E3live Original fresh frozen is a staple for me while home, or the individual singles of BrainON for domestic travel... E3Live Blue Majik travel singles get dumped right in my mouth under my tongue and the E3 Enzymes Supreme I take daily throughout international travel..."
"Poses that move you up and over backwards reset our body’s nervous system, alleviate pain and stress in the spine, and elongate our often forward bent front body." "Your intuition is strong and knows more than we give it credit for. 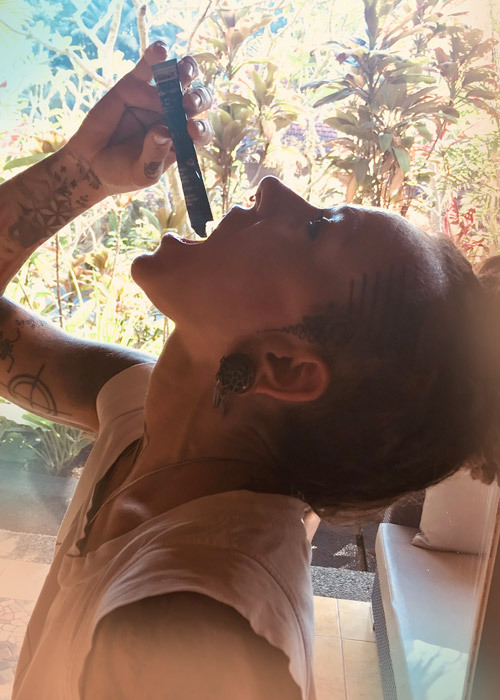 Trying to fit yourself into a diet box with fads and crazes only works for so long...Slowing down enough to notice our experiences in eating and in our fitness practices helps us decipher the information we are being given and continue on a path of that is unique to us. "